This month’s class is not as originally planned. We were going to continue the lesson on how images of kindness and compassion markedly increase joy, love, optimism, and sympathy. Recent events have demanded a change, however. From horrific shootings to an environment out of control to politics permeated with anger, fear, and division, what we need now is to reconnect with one another. Reconnection is made possible by embracing kindness and compassion. Embracing kindness and compassion happens once we realize that it is essential to our state of being and longevity. And it just feels good. As there is some needed detail to describe this concept, this class runs longer than our usual sessions. 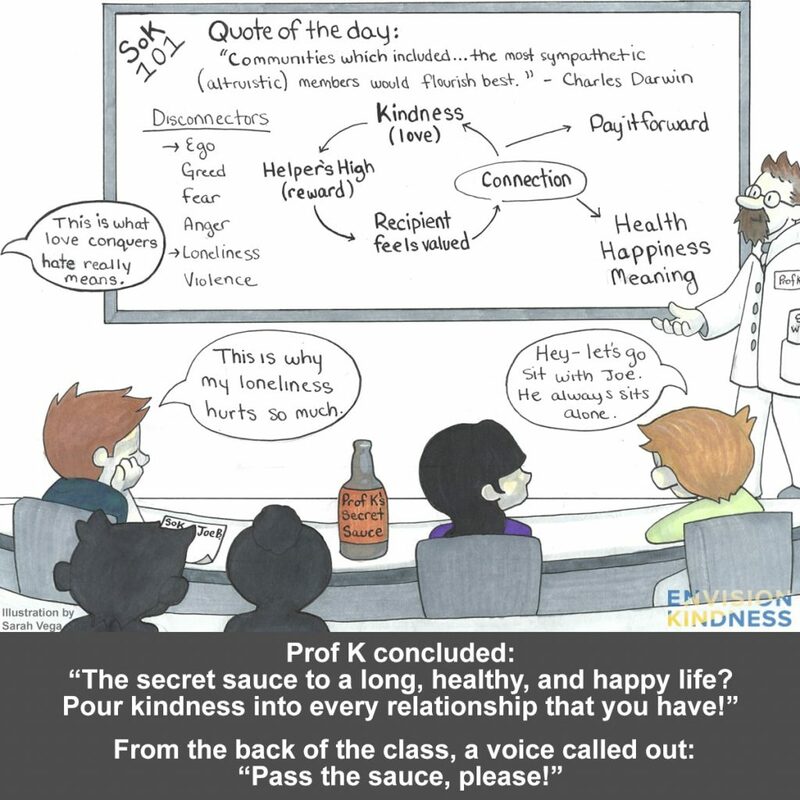 In case you can’t stay, here’s the “secret sauce” of this blog: kindness works its magic because it creates or strengthens connections between living beings. When we truly understand that we are connected to one another, we give more freely, we treat each other with respect, we act with integrity, and we trust one another. As the socio-biologic need for kindness and connection is fulfilled, health, happiness, meaning, collaboration, and peace readily flow from there. When we truly understand that we are connected to each other, we treat each other with respect and act with integrity. To effectively apply the sauce, it is helpful to understand more about the biology and psychology of social connection. Scientists have known that satisfying the need for quality connections is absolutely critical for both mental and physical health. In adults, those who are socially isolated (lonely, without quality support group) have a risk of death 26% higher  than those who have a quality social network. This is huge  and rivals other factors that I would talk to patients about, such as exercise, obesity, and smoking . Put it another way, quality relationships (interpersonal, not social media) convey a huge survival benefit (see Pietromanco and Collins ; Holt-Lunstadt ; and Reblin and Uchino  for excellent reviews). Heart disease is the major reason that lonelier people die more often . That makes sense as loneliness is a potent psychological stressor and is also associated with higher blood pressure and blood sugar. People lacking quality social support understandably also have increased anxiety and depression . The problem is huge: the former US Surgeon General, Dr. Vivek Murthy, has talked about the loneliness epidemic in America  and the United Kingdom has established governmental effort to address this issue . for both mental and physical health. The need for connection is also seen in children, in animals, and even in insects . Given how widespread and strong the drive for connection is, the only logical conclusion is that the need to meaningfully connect with other living beings is baked into our biology. It makes sense—it is so important that nature has provided us with the built-in reminder system, like hunger, thirst, etc. In fact, the area of the brain that is associated with the experience of social pain or loss is the same as with physical pain , which partly explains why emotional loss is painful as well as why isolation in prison is such a powerful punishment. That we need one another may be an evolutionary adaptation to enhance survival. Evolutionary biologists like Darwin  and EO Wilson described that, in contrast to the concept of survival of the fittest (of an individual), members of a group must sacrifice for one another in order for the group to survive. Examples have been described throughout nature and across species , like bats or ants or primates as well as humans. To sacrifice for, or GIVE to others honors that powerful, inborn drive to promote group survival. Kindness and sacrifice, therefore, is the “default mode” of how (almost) everyone is born. When we give to someone else, especially for the sake of simply giving to them, we reconnect with our true nature AND we also send a signal to the recipient (and to ourselves) that we are connected. we honor that inborn drive to promote group survival. Beyond spiritual or emotional terms, that signal can be described biologically. It is an internal signal in our brains coined by Allen Luks as the “helper’s high.” Scientists know that performing, thinking about, or simply seeing kindness activates the same parts of the brain responsible for reward (pleasure) . It causes changes in brain chemistry, including the release of endorphins (natural opiates in our bodies), dopamine, and serotonin . The latter two are both neuro transmitters associated with feeling good. It is for these biological reasons that kindness can induce happiness: a natural, internal high or elevation. No other pharmacology (drugs) needed. How does kindness cause connection? On an obvious level, when someone gives of themselves to another person (even a smile or friendly hello), they are saying to that person “I see you—you are important and need to be recognized and/or supported.” Recognizing another person in a positive way makes the receiver feel valued, establishing a connection. And because nature has blessed the giver with internal reward mechanisms, the behavior can be reinforced as the giver’s biologic destiny has been momentarily fulfilled. Once we are enlightened that we are connected to one another in many ways—kindness flows readily. This becomes a self-perpetuating and virtuous cycle. to one another in many ways—kindness flows readily. If the biology of kindness and connection is so powerful, why are we experiencing so many of these distressing events? Why are people in the US (and elsewhere) more anxious, becoming addicted to opiates, and committing suicide more if the economy is good and violence is lower than it ever has been? The answer to this is complex and multifactorial: one way to frame the problem is that people are more disconnected than ever before. A major factor is that negative stories and images are very impactful—just like our system is programmed to be kind, we are also programmed to identify threats and respond to them. These unrelenting negative images, stories, and experiences DISCONNECT us from each other—ego, fear, anger, greed, etc., all make us think that we need to protect ourselves from other people. The second factor is that while people may appear connected through social media , these connections do not replace higher quality interpersonal relationships. In fact, as people spend more time on social media on a visual diet that disconnects us (and induces attention deficit disorder), they spend less time in interpersonal interactions. And perhaps there is a sense that so many other people are doing different things whereas their own lives appear more at a standstill . When people don’t feel connected to others, there is less kindness, tolerance, and collaboration, which perpetuates itself. And in extreme cases, violence. In contrast to the kindness-connection loop, this is a vicious and destructive cycle. The problem is: people are more disconnected than ever. So how can we conquer this? We need to connect more meaningfully with others and show them, even in simple ways, kindness. For example, in school or at work, are there people who seem more alone or stick to themselves? Instead of ignoring them or thinking they are anti-social, why not say “hello” and/or smile as we walk by; eat lunch with them, or recognize the good work that they do? Or call a friend just to say hi and see how they are? Visit the elderly; volunteer for a worthy cause. In this frame of thinking we don’t let political or racial divisions rob us of the opportunities to work together. And if we are connected to each other and to other living beings, we take care of the environment and move rapidly to address climate change. Christian Picciolini, the former neo-Nazi who helps white supremacists find their way back to mainstream society, bases his approach on that many of the current neo-Nazis simply want compassion and a way to belong. Every soul, he says, needs identity, community and purpose. All of these can come through meaningful connection. His recommendation? “Find someone who doesn’t deserve your compassion and give it to them because that’s what happened to me.” His Tedx talk gives an insightful personal view that exemplifies the thesis of this blog . Every soul needs identity, community, and purpose. and give it to them. The holidays are almost here and 2019 is just around the corner. Want to give yourself, your family, your community, and even strangers a significantly better 2019? You can: try more kindness. Connect more. There are lots of ways once we recognize how interconnected we are. Everything flows from that. A way to think about this: it’s similar to the impact of clean, sanitary water to drink on health. If we would insist on clean water, wouldn’t we insist helping people create quality relationships? It is of great relevance that loneliness is actually greater in the youngest generation, i.e., those most socially connected. To learn more about this, check out this important study from Cigna.